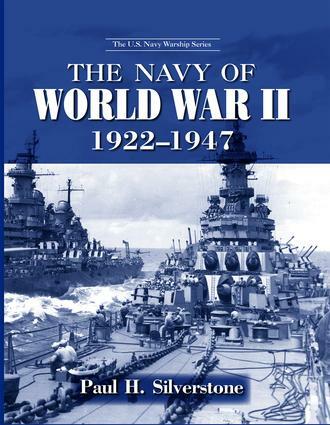 The Navy of World War II, 1922-1946 comprehensively covers the vessels that defined this momentous 24-year period in U.S. naval history. Beginning with the lean, pared-down navy created by the treaty at the Washington Naval Conference, and ending with the massive, awe-inspiring fleets that led the Allies to victory in the Second World War, the fourth volume in the celebrated U.S. Navy Warship series presents a detailed guide to all the warships that exhibited the might of the U.S. Navy to the fullest. Showcasing all the ships—both the famous and the often overlooked-that propelled the U.S Navy to prominence in the first half of the twentieth century, The Navy of World War II catalogues all the warships from this era, including those that did battle in the European, Mediterranean, and Pacific Theaters from 1941-1946. From the fleet attacked at Pearl Harbor, to those that fought valiantly in the Battle of the Guadalcanal, to the official surrender of the Japanese on the deck of the USS Missouri, this latest volume is the definitive guide to the warships that defined this pivotal period in U.S. naval history. Each volume in the U.S. Navy Warship series represents the most meticulous scholarship for its particular era, providing an authoritative account of every ship in the history of the U. S. Navy from its first incarnation as the Continental Navy to its present position as one of the world’s most formidable naval superpowers. Featuring convenient, easy-to-read tabular lists, every book in the series includes an abundance of illustrations, some never before published, along with figures for actions fought, damages sustained, casualties suffered, prizes taken, and ships sunk, ultimately making the series an indispensable reference tool for maritime buffs and military historians alike.